Lately I’ve been referring to myself as a slow-blogger, taking inspiration from the slow food movement. I’ve also made it no secret that I prefer face-to-face (un)conferences to online ones of any sort because of the same kind of slow unfolding of discovery through the dynamics of being together in the same room, looking at one another, eating together, laughing, commiserating over the course of a couple of days. But as the online world started to move on from blogs-as-reflective, centering spaces, as people’s posts seemed more and more quick thoughts on the run about other blogposts instead of syntheses of many and varied tendrils of theory and practice, I secretly wondered if I was just making excuses. Was I was a slow blogger because I was slow? Did I hate online conferences because I was bad at them? Was I not the tortoise at all, but the tree, rooted in place, stuck in the old mud? 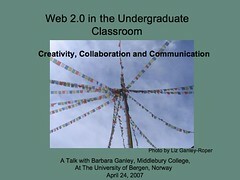 University of Mary Washington’s outstanding Faculty Academy has me jazzed again, illuminating the value of my love of blogs and gatherings, while helping me to lighten up and be playful, to take risks again instead of being the person who once took risks, was noticed because of it and now spent her time talking about taking risks. Simply put, Faculty Academy was one of the best two-day events I have ever attended –and as fabulous as Alan’s talk was (and believe me, it was fabulous) and as rich as the many presentations and Karen Stephenson’s keynote were, and as much as I learned by pushing myself in my talk to find words to express my commitment to blogging as learning tool, the best part was the relaxed way the conversation deepened, grew more complex and interesting as the days unfolded. Laughter. Jokes. Arguments. Tips. Questions. Ideas–oh, the ideas. And more laughter. Alan and Martha and Laura and Jim, just to mention a few, have all captured pieces of this extraordinary gathering. So, what in practical terms have I taken away from those two days? 1. Well, I am now Twittering and seeing that a little fun online is a good thing. I can see beyond the fun, too, as I am served links with my breakfast to posts I wouldn’t necessarily come across on my own, and 140-character snippets of experience or thoughts just percolating. I’m hooked. And while I know it is not microblogging proper, for a slowblogger, it is, it is. And I see how I can use it with my students to communicate to one another as they tackle a reading or a project, as they come across relevant sideshoots and first stirrings of thoughts to share with the group, titles, mini-abstracts, all while practicing the fine art of concision and threading through the absurd and funny moments of a day. 3. Remember to keep the pedagogy open the way Jim Groom is doing so brilliantly over at bavatuesdays. It’s as good as a serial to tune in to his teaching adventures. 4. Continue to focus on trust, to think about how trust plays out in departments as well as classrooms and other communities of practice. 5. Take the work but not myself too seriously–have I forgotten this? 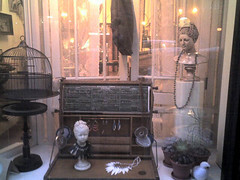 How I’ve blogged about it? Am I taking the passion, the urgency too far? After a couple of recent talks — here’s the Flickr slide set from WiAOC (I’ll post the Vermont State Colleges Academic Retreat set soon) –I felt as though I pushed too hard. Someone told me after he felt humbled by my talk. Aak! First it was a tsunami in Sweden and now this–time to lighten up. The discussion between Alan, Chris and Jim brings out both the value of a deep reflective practice but also the absurdity of jumping on a single bandwagon. I gotta get back into Second Life. Change my avatar a bit. Humor her up. 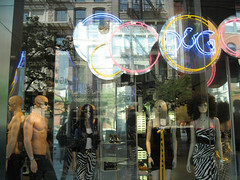 Heck, if I can move from snapping funky windows in the Lower East Side to Dolce & Gabbana’s over-the-top display (kind of Twittering with Flickr, perhaps?) I might even have to get off my high horse and head to McDonald’s, something I have never ever done. I’ve got another blogpost brewing about Faculty Academy itself (right now I am teetering between slow-blogging and just plain old blogging slow). What a pleasure to try to spin the tale and capture those days and those people, and how one experience like that can spark all kinds of creative thinking and recharge the batteries. It was remarkable. For now, here’s the written version of my University of Mary Washington Faculty Academy 2007 talk; the version I actually gave, with slight digressions and shifts, will be available on the Faculty Academy site at some point if you want to hear my voice and see me gesticulate (shudder shudder). Those of you who read my blog–deserve a croix de guerre for making your way through the long posts-ha-, well, you know that I believe in a residential liberal arts experience for our undergraduates but one that little resembles what we have now in place at most of our institutions. And my use of Web 2.0, especially blogs and their buddies, looks very different from the way it looks elsewhere–you will find me blogging on my blog but not much on the course Motherblog, for instance. The blogs are open to the world. No one is denied access. You might know, too, of my concern about the divide between the Academy’s staunch commitment to tradition, this generation’s rewriting of all the rules, and the work world’s dissatisfaction with both. 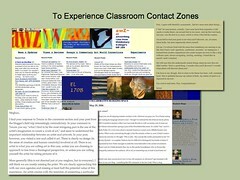 In 2001 to address these tensions within my classroom, I turned to blogs in my teaching –to reinvigorate learning (my students were wanting too many quick answers, directions to follow, forms to follow when they should have been yearning to experiment, to spread their reading wings and ruffle some writing feathers). I wanted to open the windows and doors between students, between the classroom and students’ lives, between the classroom and the world. I wanted students to look at themselves. Our first forays into social software pushed me as a teacher, too–students introduced me to new ways of thinking about academic expression, embedding audio in their research papers, photographs in in their poems, video as footnotes. They ranged across the blogosphere, brought in poets to comment, and got a little too intense at times in their discussion. My students are winning awards, getting jobs and into graduate school — with the help of this work. They’re bringing the house down. And they’ve forced me to transform my teaching and my creative work as a result, far far more than I had ever anticipated. 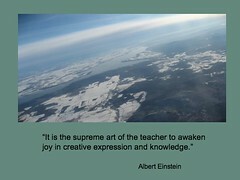 I’ve thrown whole syllabi out, changed the evaluation process, backed out of the center of the experience. 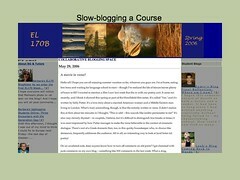 One of the most interesting developments, I think, is my strong preference for what I call slow blogging, both for myself and for my students. In my own practice, that means trying to weave together the tangled and often seemingly irreconcilable strands of what I’ve picked up in my reading, my teaching, my photographing, my living. Even the titles of my blogposts carry on for longer than some bloggers’ entire posts. (I know I know, a little economy ain’t a bad thing…) But what I’m doing is trying to discover, to uncover the relationships between what I thought two months ago, two years ago, and now, and how my interests converge and inform one another, and how the ideas I find in one place can inform the ideas from another, in surprising ways. And how my use of images might add to the total meaning. 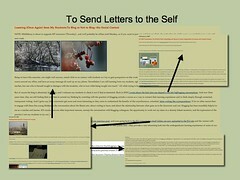 It’s a way to send letters to the self. In public, as one small piece of a greater conversation about teaching and learning. What has emerged is an organic, evolving portfolio with tags and links leading both back into my experience and way out beyond myself. I know I’m a better thinker because of my blogging –I’m more inventive and more patient. I take risks. I fail. Publicly. In front of my students! In front of brave readers who kindly argue with me, pointing out what I’ve overlooked or oversimplified. And I am learning to be tougher on myself, to insist on having something to say instead of merely repeating myself or someone else. Slow blogging is both perilous and pleasurable. 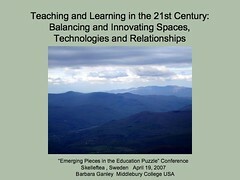 And it should, I believe, be an active part of any 21st-century teacher’s practice as a window into this generation’s world as well as a way to develop teaching-with-technology skills and a deep reflective practice. In my course design I’ve come to blend solo slow-blogging into loose blogging conversations and more staccato posting that lead to spirited conversations face-to-face. Students can’t see their posts as mere messages in a bottle. They are writing to and for actual people, people they have to see in class and hear from on the blogs, people who will inspire them and teach them through their own work put out there in our transparent, open, connected medium, people who will infuriate them with their opposing viewpoints. They learn to participate. To give. To take. 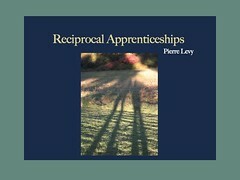 To be apprentices and experts. To enter contact zones. To invite other professors, family, friends to take part. 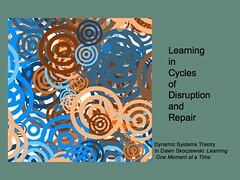 We talk about chaos and learning, about disruption and repair, about what Claude Levi-Strauss says about artists never being alone (in Davenport), about social learning theory, about John Dewey. We talk about plurality, about recognizing our own biases, our own clichés (see (Skorczewski, p 100). This is essential in our diverse classrooms, essential in our times–and what better place that a stable learning community to explore encounters with the other. It’s the end of the first, remarkable day at University of Mary Washington’s Faculty Academy 2007. Hearing Gardner Campbell, Alan Levine, Laura Blankenship, Steve Greenlaw and the inimitable Jim Groom –for starters– present, share stories, and converse–well, it’s been an inspiring day. And as a result I’m almost ready to explore Twitter and get back into Second Life, this time with a voice. It’s one thing to understand why we need to integrate Web 2.0 practices into our teaching; it’s another to do so gracefully and effectively within a semester system. How do we actually move into and then out of courses that take advantage of a full range of teaching and learning spaces, technologies and relationships? Do we start students out on course blogs and/or wikis the first day or do we start out in traditional reading and responding and move slowly into more innovative practices? How do we pull in RSS and tagging, multimedia composing and sharing? Do we take time to run technology workshops for our students? How much time? How and when do we weave in the core subject matter? 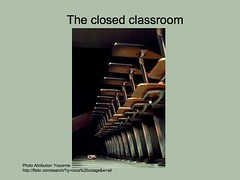 How do we prepare our students for the freefall experience of the first weeks of this kind of classroom? In this workshop we’ll take a good look at the opening two weeks of our courses, exploring exercises that build a strong learning community based on reciprocal apprenticeships while introducing students to the kinds of technology they’ll be using, and immersing them in the heart of our subject matter. We’ll also consider the end of the semester and how we help students move beyond the confines of the course through self-evaluation, hypertext reflection, and an old Russian custom. I’m moving more and more to ways in which blogging and tagging and image-sharing and digital storytelling enhance the here-and-now, the communities in which we live and work, and in this particular case, the classes we teach. And to do that, it is essential to spend time at the opening of the semester talking about who we are, what we each bring to the learning adventure, why we’re in this class, and what we hope to get out of it. We talk about building a blueprint together based on our goals and available materials, and then think about how we actually build the course experience together and alone. But first, I have to think about how the various means of expression might have an impact on the learning and on the community. How and why will we use social software? Will we venture further into online work than blogs? Why blogs at all? Will we really blog or use the blog structure as a vessel to hold traditional assignments? Why, for example, would we blog in a course on Ireland? How might hypertext and digital storytelling enhance the experience? How might we use audio as a tool for expression and for revising and for exploring ideas? Cameras? Images we take, images we find? How might we want to connect with experts out in the world–would we invite them to participate in blogging-invitationals? Would we want them to respond to our work? 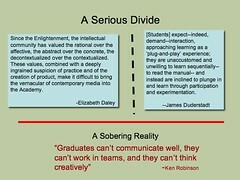 What is the role of loose dialogue and conversation, of let’s-talk-about-any-thoughts-we-have in the course? Do we want to link to our work in other courses? To our other online worlds? How do we also work in traditional modes? How do they intersect and influence one another? How much time can be devoted to learning how to use the tools, how to become comfortable with the practices? How much time do we devote to meta-practices, to reading and talking about what we’re doing online? How can we capitalize on the fact that we have the luxury of being together in class twice a week–do we devote that time to presentations, to discussion, to lecture, to feedback, to projects? EXERCISE ONE: What kinds of teaching will you do in class? How will your students spend their time out of class? What is the relationship between content and process? How will you make your pedaogy transparent? The Irish seminar blog really focuses on collaboration and so has more of a group-blog feel to it than others; one of our goals is to think about how our community of mutual apprenticeships works–how to be engaged in a liberal arts college. A composition class balances between group and individual work, and so the unit plans are posted as we go, as we develop as thinkers and writers and see what next we need to learn and to practice. An arts writing class takes on a ‘zine-like, real-world look with multiple columns and choices as to what is posted where and why. EXERCISE THREE: Jot down notes about ways in which you have, in the past, opened your course. Why have you spent the first weeks this way? I call this first part of the course Cracking Open the Course and the Imagination, in my creative writing classes; “Exploring the Course” in composition classes, something we do as we pull up the blogs; Knowledge Trees in a first-year seminar on Ireland (the first part of this exploration is done online before the students even set foot on Middlebury’s campus). Just before they set off on the long journey across continents and oceans to whatever new life awaited them, Russian families would gather as a group and sit down upon their bags, look around them in silent awe and reflection. How important this is to stop and make note of the moment, at what has come before, at what it means to be in this moment—we do our own version of sitting on our bags taking in the wonderment of this moment when we are about to begin our journey together. We also might create and present small-group metaphor-portraits in which the groups try to represent themselves in a kind of logo or symbol that represents all of them. In class we talk about how to participate in discussions and feedback-loops, about levels of diction and discourse, using archives from previous semesters for our fodder. We’ll discuss how they will help design the course, how to make it work for us as individuals as well as the group. We talk about collaboratives and about the purpose of a liberal arts education and how our course intersects with those goals. We talk about trust. About making mistakes. Asking dumb questions. Daring to ask dumb questions. 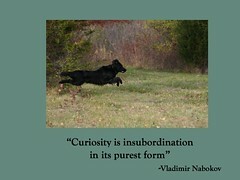 About playful inquiry. About TRUST. And efficacy. We try to place our semester within a much bigger picture of our life journeys and the greater conversations we will join. From our letters to the class, we begin to reflect on our blogs, we push one another to grow as learners and writers, we push ourselves. We might read Levy. Or Greene. Or Dewey and Wenger. We read each other. We always read each other. And we read deeply in our discipline. 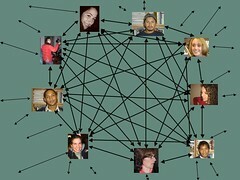 We look at online communities and try to figure out what makes them successful. We read the early-in-the-semester-works of students from previous semesters. 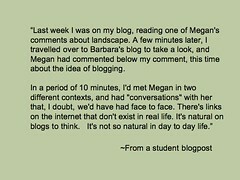 Blogging enhances the undergraduate course experience, I believe, when we spend time laying a careful foundation for our work online and in class, thinking and talking about how and why connecting this way plays a fundamental role during the precious brief twelve weeks we have together. Because we rarely make our pedagogy visible, students are far too accustomed to going through the motions, to taking our word for it that our assignments have value, to completing work without thinking about how it fits into their lives. I can see the difference in the depth and authenticity of student work when I have taken the time to talk about the value of slow blogging, of slow learning compared from when I’ve been all in a rush to get to the facts and processes of the discipline. 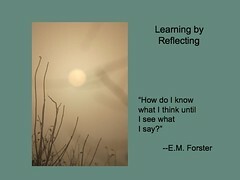 Ongoing hypertext narrative reflection, renewed goal setting at mid-term, some reflections can be done via podcasts. 2. They prepare for their evaluation conference with me by posting the final reflection which should include a sense of what this course means to their larger learning journey, and bringing to conference a proposed grade and defense of that grade. 3. We return to our suitcases and to our original letters and Knowledge Trees–students write letters to the next class about what to expect, what they wish they had known at the start, and any other advice. 4. Other options: A gathering of quotations from one another, from other writers in our field. Yes, I’ve been away from the blog for a month now, first with my family, and for the past almost three weeks, in Scandinavia for a workshop and a couple of talks and a bit of touring. I left home the day of the Virginia Tech tragedy and have relied on blogs for much of my contact with the U.S. since then; it is a strange time to be away, with disturbing reports streaming across the Atlantic. Out of the distance; blog reading; travel; and stimulating talk with people at the Humlab in Umeå, the conference at Skelleftea, and the University of Bergen talk are stirring my next series of talks and workshops this month, at The University of Mary Washington”s Faculty Academy, Webheads in Action Online Convergence and the Vermont State Colleges’ Academic Retreat. I am convinced that while it’s important to keep talking about change in education writ large, the most important work occurs day by day in our schools and in our communities writ small. Especially now. Will’s discouragement by the rate and depth of change is to be expected–absolutely–. I find people get quite excited about rethinking teaching and learning — during and just after conferences–but to return to their schools and really make profound shifts takes an unusual level of energy, commitment and, well, bull-headedness. It takes time. Passion. (Someone in Sweden called me a tsunami after my Skelleftea talk.) The kind of change I’m talking about bubbles up from the trenches, one teacher at a time, one classroom at a time, one school at a time, something I wrote about for a talk in England a year ago: Losing Hope to Effect Change. As twenty-first century writers capturing our experience of place and time, we choose from a smorgasbord of media, forms and audiences, both traditional and emerging. In this workshop-style course designed for students interested in creative nonfiction, we will explore the far reaches of writing today through exercises, research, field trips, presentations and collaborations, We will read John D’Agata’s The Next American Essay as we also examine and engage in blogging, hypertext, radio stories, and/or multimedia essays. At semester’s end we will publish our work online. We will also mentor Vermont high school writers, online and /or in person. It will be interesting to see if the course description entices any incoming students into joining me in this exploration. In the meantime, I’ll post more thoughts on the upcoming talks and text/audio versions of recent talks, once I’ve returned to Vermont. 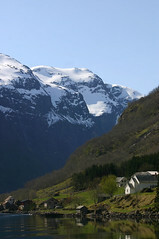 For now, from Bergen Norway, here are links to my talk slides and wiki. The basic idea behind it is to stimulate innovative cooperation in a dynamic interdisciplinary setting. Here the humanities and culture on the one hand and modern information and media technology on the other interface and collaborate, both in real terms and virtually. 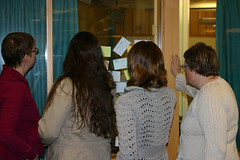 HUMlab attracts students, lecturers, researchers, artists, engineers, media people and others. The aim is to bring together a diverse range of individuals and groups in a creative, stimulating and innovative milieu and – via new methods, new technology and interdisciplinary projects – do things that have never been done before. 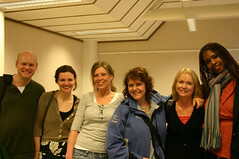 Dag, and Peter and their colleagues. I created a wiki for them and a practice blog, based in part on the wiki Bryan Alexander set up for our Educause workshop, and the one Barbara Sawhill and I made for our NAIS workshop in February. 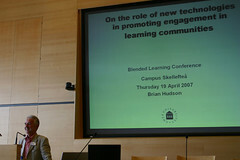 and his experience with a blended learning, inter-campus Masters’ program. Here are my slides from the talk. Once the audio is available I will create a file that weaves them together. Then it was on to Bergen where I met the remarkable Jill Walker and Scott Rettberg (and ate his amazing cooking), and the wonderful Toril Salen and her blogging cohorts. 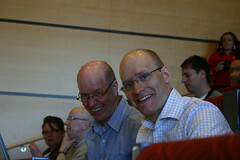 I also saw Jan Hoem again, who had given a great presentation at Blogtalk2 in Vienna. Here are the talk slides; I’ll post the audio when I return.